Quondam's inaugural exhibit investigates fifteen examples taken from architectural history that unwittingly set a precedent for either virtual architecture, museums of architecture, virtual museums of architecture, or all of the above. Along with calling out the precedents, the exhibit also demonstrates how each example inspires further architectural manifestations that have a place in both the real and virtual realm. This accidental genealogy of virtualness in architecture has many patriarchs and an ancestry that goes back almost 1900 years. The lineage varies in ethnicity, but it is all contained in Western heritage. The elders are either Roman or Italian, culminating with Piranesi as the consummate master of the virtual realm. By the 19th century, the patriarchs move first to France, and eventually throughout Europe and on to America. All genealogies, even accidental ones, are not possible without matriarchs, however. So where are the "mothers" of architectural virtualness? The answer lies precisely in the element that is most consistent throughout architecture's virtual family tree, namely, the community of buildings and space. Although occasionally only a collection of buildings, the matriarch is most often a city, a villa, or even a convent. It is within these domains that the gestation of architectural virtualness occurs. Hadrian, Hadrian's Villa (Tivoli: 118-125). Museum of architecture and virtual space. 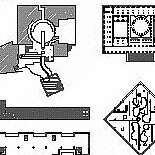 Vast collection of architectural spaces (many plan and sectional variations). A collection of vaulted structures. The first example of a virtual reality in that different parts of the villa were to evoke the nature and "feel" of different parts of the Roman Empire, e.g., the long canal was to remind the Emperor of the Nile valley in Egypt an the so-called Maritime Theater was to transport the Emperor to an island in the Mediterranean Sea--it is exactly the notion of an artificial creation made to mimic an actual distant place - the notion of simulacra - that relates the villa at Tivoli to today's idea of virtual reality and sheds new light on the notion of virtual architecture. The notion that buildings as ruins take on more and more virtuality over time. ...Greber, a French landscape architect who drew the final plan for the parkway, invited Paul Philippe Cret to collaborate. The gateway to the museum is a replica of the Chateau d'Issy reconstructed by Rodin for his own home in Meudon, France. The libraries rapid growth made it a logical institution to occupy one of the sites on Logan Circle, designated for civic buildings in the parkway plan. Since the parkway was modeled after the Champs-�lys�es, it was logical for the library to take its form from the twin palaces on the place de la Concorde, which occupies a similar position on the boulevard. The choice was probably influenced by the recent trips to France of Julian Abele, a black architect who was Trumbauer's chief designer. The Cathedral is the oldest building on Logan Circle, one of the original five squares in Penn's Plan. Horace Trumbauer, C. Clark Zantzinger, Charles L. Borie, Jr.
After many years of discussion, a site for the new museum was selected on the hill known as Faire Mount, at the end of the recently completed Benjamin Franklin Parkway. 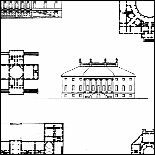 Trumbauer's chief, Julian Abele, the first black graduate of the University of Pennsylvania architecture school, returned from Greece with the idea of building three temples on a solid rock base. The final design is a compromise among his ideas and of the other architects. The model for Philadelphia's Benjamin Franklin Parkway, a 12 lane tree-lined boulevard linking the city center and Fairmount Park, was the Champs-Elysees of Paris. This grand street, like the one in Paris, was to accommodate all kinds of outstanding civic and religious institutions. Although the entire scheme was not carried out as planned, the Parkway nonetheless manages, in part, to evoke the character of Paris and other capital cities of Europe. Like Hadrian's Villa, moreover, the Benjamin Franklin Parkway is an unanticipated and uncommonly "real" prototype of virtual reality in that it manifests an environmental facsimile and effects a geographic displacement. 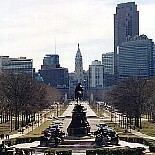 The centerpiece of the Parkway is Logan Circle, which is one of Philadelphia's original five squares geometrically transformed. As a prominent point in the Parkway plan, Logan Circle is the focus of many civic buildings, including the Free Library of Philadelphia by Horace Trumbauer and the Municipal Courts by John T. Windrim, which as twin buildings replicate the twin palaces facing the Parisian Place de la Concorde. There is the likelihood that the choice to embellish the French-modeled Parkway with more Parisian themes came from the black architect Julian Abele, Trumbauer's chief designer, whose return from a trip to France came shortly before the drafting of the Free Library's design. The buildings surrounding Logan Circle do not only evoke Paris, however. The panoramic outlook stemming from the Circle presents a number architectural spectacles: the Cathedral of SS. Peter and Paul recalls Renaissance Italy; the view towards Philadelphia's City Hall offers a slice of a modern metropolis; and the portico of the Franklin Institute calls to mind the grandeur of Imperial Rome. Looking in the opposite direction from the city, the Parkway opens as a grand boulevard leading to the temple-like Philadelphia Museum of Art. Halfway between Logan Circle and the Museum of Art is the Rodin Museum, which is another virtual piece of France in that the gate to the museum's forecourt is a replica of the Chauteau d'Issy reconstructed by Rodin for his own home in Meudon, France. At the head of the Parkway, and looming high on the hill called Faire Mount, is the Philadelphia Museum of Art, which is also by Horace Trumbauer. Besides traveling to France, Julian Abele, Trumbauer's chief designer, also traveled to Greece, from which he returned with the idea of building three temples on a solid rock base. Along with bringing a virtual Acropolis to the Parkway, Abele's traveling and subsequent building are also reminiscent of Hadrian's travels and the Emperor's subsequent building activity at Tivoli. Piero della Francesca, Ideal City (c. 1470). Perspective as a new invention and technology. A totally new space created and made explorable through the invention of a new technology--perspective. Just as 3-D CAD modeling and virtual reality are today revolutionizing the nature of human perception, so too did perspective revolutionize the nature of human perception, at least how human perception is explained and represented. The city itself is imaginary, i.e., it does not actually exist, therefore, its nature is virtual and the ideal positioning of ideal buildings calls into play the concept of virtuality--it is not difficult at all for the viewer of the scene to further imagine what it would be like to walk through, and thus experience, this space. Creating an illusion of reality. Quondam, Perspective(s) of a New Ideal City (/museum) (1997). 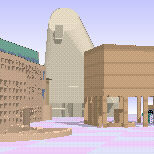 A new virtual place composed of buildings from Quondam's collection. With computer technology it is now possible to enter into this new environment. This particular setting is doubly virtual because the buildings within it are architectural designs that remained unbuilt. CAD allows both the construction and the investigation of this new place. The scene is no longer limited (confined?) to a single viewpoint. The colors of the place can be changed at will. This is a new alternative to the various jump-off points for the notion of an interactive environment. The combination of both a real setting with imaginary elements/buildings is the ground that is newly broken here. 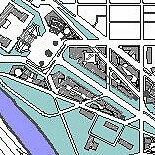 There are here at least three different degrees of virtualness: a) an imaginary Venice with buildings from another place entirely; b) the replacement of an existing condition (the Rialto Bridge) with an unbuilt alternative for the same setting; c) a virtual museum of Palladian architecture. The notion of the analogous extended to the notion of the analogous building. A single building composed of analogous parts from other buildings. 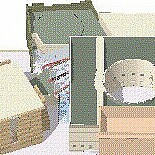 An exercise that CAD and a collection of 3-D models make possible. 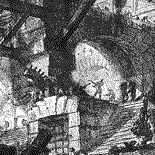 Piranesi as virtual architect and the Campo Marzio as a virtual city. 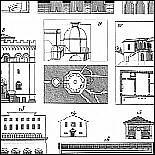 Campo Marzio as a vast (virtual museum) collection of architectural plans. Virtual museum of roman architecture. Virtual museum of building types (esp., portici, horti, sepulchers). Tromp l'oeil as virtual representation--simulacra. Carceri as cyberspace and ultimate video game - true precursor of virtual architecture as it is most envisioned today. 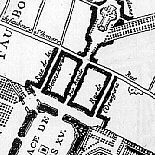 Pierre Patte, Key Plan of the Monumens eriges en France a la gloire de Louis XV, (1765). All the traits of the older examples come together; recount the "family tree" thus far. The premier/prototypical virtual museum of architecture (as a book/collection of drawing plates). Collection of architecture by type. Collection of architecture presented at the same scale. Jean-Baptiste-Louis-George Seroux d'Agincourt, The History of Art through Its Monuments from Its Decline in the Fourth Century to Its Renewal in the Sixteenth (1811-1823). Another virtual museum of architecture in book form although its primary purpose was to be a history through monuments and there is a distinct polemic involved. Essentially a museum of Christian architecture. Unfortunately the drawings are not presented at the same scale. 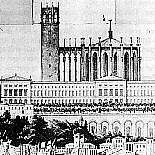 Karl Friedrich Schinkel, Project for a Prince's Residence (1835). 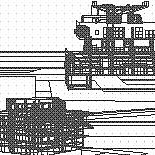 Royal "residence" as virtual/ideal (unbuilt) city. Had this been built, it would today indirectly act as a pseudo museum of architecture in that the complex contains (consists of) many architectural styles and programs (i.e., building types). It is like a virtual museum of early 19th century historicist/romantic architecture. There is also the sense that this project is very much architecture almost purely for architecture's sake, therefore, again evoking the notion of a virtual museum of architecture.